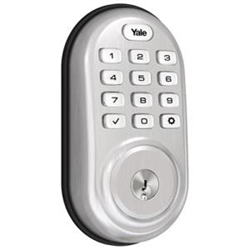 Never worry about keys again with the Yale Assure door lock. Easily track when someone has locked or unlocked the door. Give out permanent or temporary secure virtual keys to friends, family or service providers. Key expiration can be set through the free August app which also gives you the ability to monitor as well as lock and unlock your door remotely. If your phone battery dies, you can use a code on the keypad to open the door. Want to check the status of your lock but don’t have free hands? No problem! 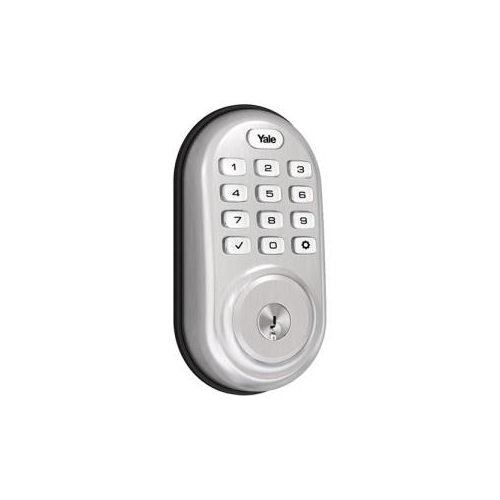 Yale Assure lock is compatible with voice control for the Alexa, Google Assistant and Siri. DoorSense ensures the door is always locked when you leave so you don’t need to second guess yourself. Simple DIY installation lets you replace your existing deadbolt in minutes using only a screwdriver. To connect to your August app, insert the August module into the lock when installing, plug in the August Connect and download the app which is available for both Android and iOS. Face Bore Hole 2 1/8"
Adjustable Latch 2 3/8" or 2 3/4"
Door Thickness 1 3/4" to 2 1/4"
Strike 1 1/8" x 2 3/4"